We left the morning completely open for sleeping. Our track record of attending morning tours on the first full day: exactly 0. We don’t sleep on planes, so we tend to sleep 12 hours to acclimate to the time change and we assumed our parents would do the same. We didn’t end up sleeping that long, but it was still great to have the extra time before we had to be somewhere. It gave our dad time to go to a couple of pharmacies to get replacement medications and the rest of us time to get breakfast from a neighborhood store. Truthfully,we only planned ahead about lunch and Villa Maraini and left the rest of the day open to chance- just set out and see what we see. We had been given recommendations from our host regarding the best places to eat in the neighbourhood. We chose one of them and set out to find it. Eventhough it sounded pretty easy, Tara and I are nearly completely directionless. We grew up being told, “no, the other left or the other right” and it’s never gotten much better. We began with Tara leading -relying on her phone GPS. It wasn’t quite as easy as it appeared to be though because her GPS kept re-routing. After walking in circles, our dad took out his phone, put on GPS and tried to give us different directions. When we were deciding what to do, our dad decided to sit down on a wall beside Ludus Magnus and regroup to figure things out, but Tara thought she had it figured it out and kept walking. I thought it was funny and snapped a picture to capture the moment. At least we enjoyed our walk around the neighborhood with scenery of the Colosseum and Ludus Magnus to admire. 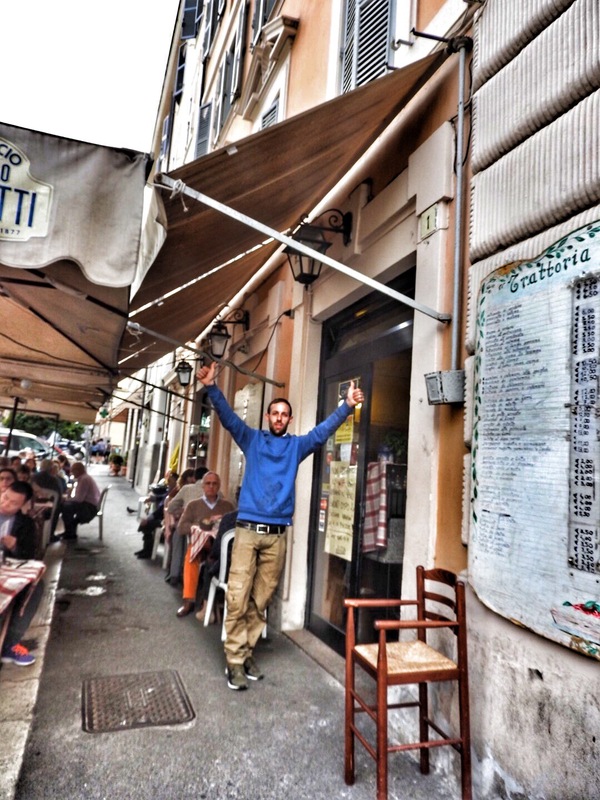 After a few minutes, we all agreed to let our dad lead & made it easily to our destination, Trattoria Pizzeria Luzzi. We were really happy to arrive and not have to wait for a table, even if it was outside and it was threatening to rain. Of course, drinks were the first order of business. Tara was excited to have a Fanta again and she and our mom were thrilled about the 3 Euro table wine. We enjoyed lunch of mostly bread, lasagna and ravioli. This place became one of our favorite neighborhood restaurants because the food was good, the prices were really reasonable and the people were very friendly. After finishing our lunch, we decided to explore the neighborhood for a few minutes. 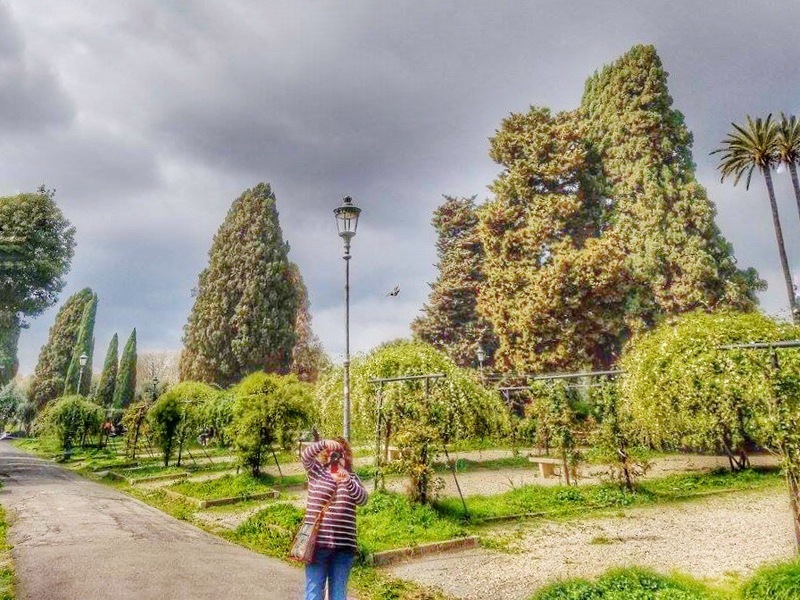 We started with walking around the neighboring streets before deciding to go walk around Parco di Colle Oppio. Upon entering the park, we immediately saw many people out exercising, just enjoying the breezy weather. After a short walk inside, we noticed the statue of Alfredo Oriani. He was an Italian writer, author and social critic, who was admired by Mussolini. The statue was completed the thirteenth year rule during the Fascist regime, 1935. His works were banned by the Catholic Church in 1940 when they placed them on the Index Librorum Prohibitorum. We only had a few minutes to stay, but we all agree we would have enjoyed staying longer to explore more of the area. It is considered an archaeological park. Much of Domus Aurea lies under it and contains the ruins of the Baths of Trajan and Titus. It’s also an easy walk along a central avenue in the park to a view of the Colosseum. Although we found it to be a great place to take a break from the noise and traffic the Coliseum area is synonymous with, it is recommended not to visit after dusk for safety reasons. After the park, it was time to go to Villa Maraini for our scheduled tour. Villa Maraini was one of those unique places that is not generally on the itinerary of a first time visitor to Rome. When looking for activities to do on a Monday though, you will find that many places are closed. I happened to read about the Villa on TripAdvisor and found out it was open for tours. It has the highest rooftop view in Rome, so we wanted to check it out. St Peter’s Cathedral is higher, but it’s located in Vatican City. When are tours offered? Monday’s are the only day in the week tours are offered and reservations are necessary. Currently, they are only offered at 3:00 PM and 4:00 PM. How do I make a reservation? You can make it through their website, call or contact them through TripAdvisor. How much does it cost? €5. Closest metro? Barberini metro. It’s about a 15 minute walk, mostly uphill from there. When we entered, we immediately went to the office to confirm our attendance and pay the tour fee of €5/person. We were told to go back outside to wait until the rest of the group arrived. We spent that time enjoying the man made cave and pond. Once the confirmed group was gathered, our guide joined us outside. She introduced herself and began telling us the history of the Villa. The Villa was built in 1903-05 by Otto Maraini, the brother of Emilio Maraini. Emilio was a wealthy Swiss businessman that made his fortune turning beets into sugar. He married Carolina, who later donated the Villa in 1946 to the Swiss Confederation to be used as a cultural center, intended to be used for scientific and artistic collaboration between Switzerland and Italy. Today, the Villa is an active property. There are residents living in the house that are taking part in a residence program that was established that is primarily available for Swiss Citizens or Residents that work in the arts and science field for 4-10 months timeframes. There is also a full time staff that works at the property. For this reason, only part of the house is available for touring. The Villa was built on a fake hill, which was made using rubbish resulting from workers who initially used the site as a dumping ground. Instead of finding the rubbish a nuisance, the owners took advantage of it. She then led the group up the hill to the back entrance. View of the back of the house walking up the driveway to reach it. Original pottery salvaged from rubbish. View of the expansive gardens of the back part of the house. The outside porch area had a seating area and sculptures on the walls that had been salvaged from the rubbish. We entered the house in a back foyer. It’s a relatively small room with a group of 10-12 standing in it. I was immediately drawn to the ceiling, but didn’t have the best angle for taking pictures. Our guide spoke mostly about the staircase. Unlike most other places in the house, the staircase is made of red marble. The majority of the house is made out of travertine. Moving on from the foyer, we next went to the dining room. It had been recently used for a function, so they had removed most of the furniture from the room. Next, we made our way to the gentlemen’s recreation room, which I found the parquet ceiling fascinating. After completing the tour of the main house, we made our way up the staircase to the top floor and then we’re led to a spiral staircase that led to the rooftop. As someone who has problems walking up stairs a lot of times for various reasons, these were not too difficult & everyone was very courteous about letting people walk at their own pace. We thought the view was great and had a great time chatting with our guide as she pointed out the various landmarks in the distance. We stayed on the roof for about 10 minutes before having to leave as our guide had to lead the next tour group. Overall, we enjoyed the tour. The property itself is spectacular and it was great to experience a birdseye view overlooking much of the city. After leaving the house, since we were in the vicinity of both the Spanish Steps, we decided to head in that direction. If coming by metro, they are walkable from both the Spagna and Baberini metro stops. The steps were built in 1723-1725, financed by a French diplomat, to link the Trinity dei Monti church with the Spanish Square (Piazza do Spagna)below. We didn’t get gelato and sit on the steps, like many do. We climbed to the top, snapped a few pics and moved on. We were there around 4:30 pm and there wasn’t a huge crowd. It’s also a great area to grab a snack, or indulge in some shopping! After leaving the steps, we decided to grab some food and then close out our night by going to see the Trevi Fountain since we were fairly close by. If you plan to arrive by metro, Baberini is the closest. By the time we finished our dinner and waked, it was around 8: 00 pm. It was crowded, but not overwhelmingly so. We were able to find a seat for a few minutes and snap some pictures in front. People were quite aggressive trying to jostle their way in to find a spot to take pictures. This is every bit as spectacular in person as one can imagine. The fountain as seen today was originally designed by Salvi, although it wasn’t completed and functional as a fountain until 1762, after Salvi’s death. It was designed in the Boroque style with various mythological deities featured. The fountain recently underwent $2+million dollar restoration completed by Fendi on November 3, 2015. We enjoyed seeing the fountain at night because the lighting adds an element you otherwise don’t see during the daylight hours. Make sure when you visit you partake in the local custom of dropping a coin or two in the fountain. Legend has it that if you throw one, two or three coins into the Trevi, with your right hand over your left shoulder, ensures 1) you’ll return to Rome, 2) you’ll fall in love with an attractive Roman, and 3) you’ll marry that same Roman. And, even if you aren’t into the entire legend reward system, you can feel good knowing that your contribution is donated to charity. $1.5 million was collected just in 2016. We stayed close to an hour. If we weren’t as tired as we were, we could have stayed for hours. The Trevi Fountain was a great way to end our first full day of sightseeing in Rome! We walked back to the Baberini metro to metro back to our apartment stop. We stopped by a local store, bought a bottle of wine and a snack and walked back to our apartment for the night. Metro was easy and convenient to use to these stops. Hang on your valuables and be aware of your surroundings. Pickpockets target crowded areas often and we saw a few victims in our week there.